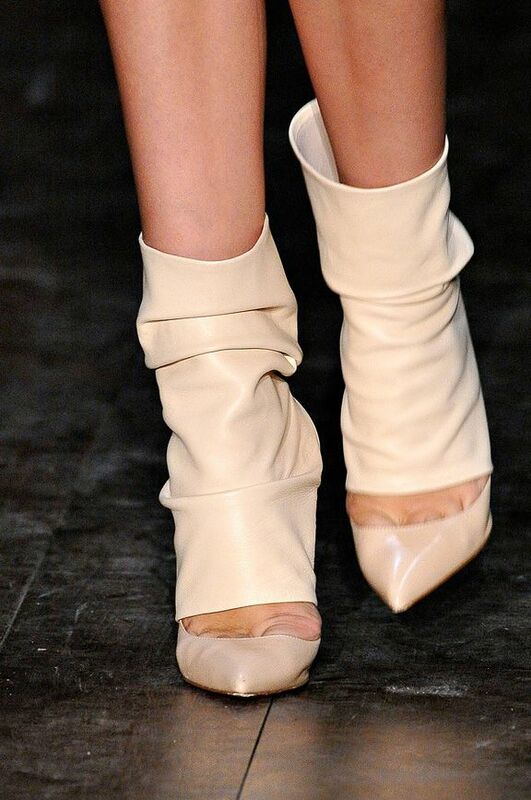 I'm ninety percent sure they are the 120mm Pigalle. These shoes are divine, shoes which you can't blatantly ignore. Victoria made hers very practical with adding the detachable leather leg piece strapped on to the shoe. What is brilliant is that these do not only give the illusion of a tight over the knee boot. The leather piece is actually removable by nature to wear with or without heels, and on top of that, the magic is to make a pair of great heels able to transition to a boot. Don't worry, looks like they're available in different lengths, in different colors. What's your take on this? Images from Vogue and Style. View her complete Spring 2012 collection here. it's a genius idea.. but i dont really like the way they look from the bottom with the buttons and all.. maybe because the leather color is sooo contrasting with the red soles..